In this vivid musical ethnography, Timothy Rice documents and interprets the history of folk music, song, and dance in Bulgaria over a seventy-year period of dramatic change. From 1920 to 1989, Bulgaria changed from a nearly medieval village society to a Stalinist planned industrial economy to a chaotic mix of capitalist and socialist markets and cultures. In the context of this history, Rice brings Bulgarian folk music to life by focusing on the biography of the Varimezov family, including the musician Kostadin and his wife Todora, a singer. 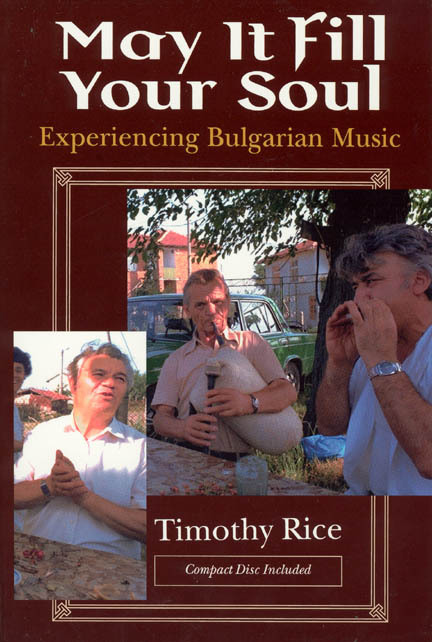 Combining interviews with his own experiences of learning how to play, sing and dance Bulgarian folk music, Rice presents one of the most detailed accounts of traditional, aural learning processes in the ethnomusicological literature. Using a combination of traditionally dichotomous musicological and ethnographic approaches, Rice tells the story of how individual musicians learned their tradition, how they lived it during the pre-Communist era of family farming, how the tradition changed with industrialization brought under Communism, and finally, how it flourished and evolved in the recent, unstable political climate. This work—complete with a compact disc and numerous illustrations and musical examples—contributes not only to ethnomusicological theory and method, but also to our understanding of Slavic folklore, Eastern European anthropology, and cultural processes in Socialist states.